The new Church of Scientology Phoenix Ideal Organization was dedicated Saturday, June 23, in ceremonies attended by more than 1,500 Scientologists and their guests. 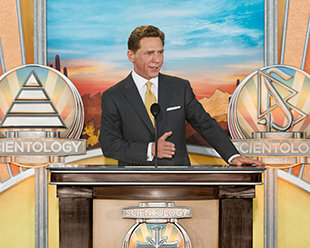 Mr. David Miscavige, Chairman of the Board Religious Technology Center and ecclesiastical leader of the Scientology religion, led the dedication. City and state leaders on hand to commemorate the opening were Mayor Greg Stanton; Arizona Interfaith Movement Founder and Executive Director Dr. Paul Eppinger; Higley Unified School District Community Programs and Policy Executive Director Tony Malaj; and West Mesa Justice of the Peace Mark Anderson. The Church of Scientology Phoenix celebrated the grand opening of their new Church on Saturday, June 23. More than 1,500 Scientologists, guests and dignitaries convened for the dedication in this city that stands as the birthplace of the Scientology religion. The ceremony dedicating the new Church of Scientology Phoenix opened with a sacred Native American blessing and the performance of a traditional Hoop Dance. Joining Mr. David Miscavige, Chairman of the Board Religious Technology Center and ecclesiastical leader of the Scientology religion (center), for the dedication of the new Church of Scientology Phoenix were (left to right): Higley Unified School District Community Programs and Policy Executive Director Tony Malaj; Mayor Greg Stanton; Arizona Interfaith Movement Founder and Executive Director Dr. Paul Eppinger; and West Mesa Justice of the Peace Mark Anderson. The new Church of Scientology Phoenix stands on a two-acre campus at the crossing of North 44th Street and Indianola Ave. The 45,000-square-foot Church provides for the delivery of all Scientology religious services and for outreach of humanitarian programs to communities across the state. The new Church of Scientology Ideal Organization stands at 3875 North 44th Street in Phoenix, birthplace of the Scientology religion. Phoenix’s Scientology Chapel provides for congregational services, as well as gatherings of all faiths. The Café is open day and evening for those attending scheduled services or simply visiting the Church. The terrace provides an ideal gathering place between Church services and events, for parishioners and visitors alike. The bookstore makes available Founder L. Ron Hubbard’s scripture on Dianetics and Scientology. In all, Mr. Hubbard’s legacy comprises tens of millions of published words in dozens of books and thousands of recorded lectures. These materials are available in 17 languages. The Hubbard Guidance Center is where Scientologists participate in auditing (spiritual counseling). Beyond this waiting area are dozens of auditing rooms to meet the needs of the Church’s growing congregation in Phoenix. L. Ron Hubbard developed the Purification Program to free individuals from the mental and spiritual damage caused by drugs and toxins, through a regimen of exercise, sauna and nutrition—all of which are provided for in our Purification Center. The Purification Center’s mural pays homage to the Valley of the Sun. The Academy is where Scientologists train to become auditors (spiritual counselors), capable of applying the technology of auditing to help others attain spiritual freedom. The Phoenix Academy comprises multiple course rooms, each devoted to a different aspect of training. 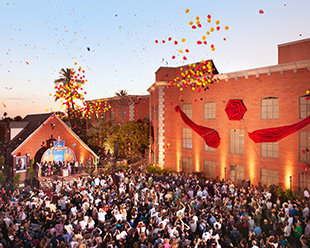 Amid a burst of confetti and a flight of balloons, the ribbon was parted on the new Church of Scientology Ideal Organization of Phoenix on Saturday, June 23. More than 1,500 Scientologists, neighbors and dignitaries joined Church officials for the dedication ceremony. Mr. David Miscavige, Chairman of the Board Religious Technology Center and ecclesiastical leader of the Scientology religion, led the dedication. Located on the southeast corner of 44th Street and Indianola Ave, the new Church stands just a mile south of Scientology Founder L. Ron Hubbard’s historic home in the shadow of Camelback Mountain. It was there in 1952 he arrived at the monumental discovery that gave birth to the Scientology religion: the isolation, identification and exteriorization of the human spirit. During the formative years of the religion, Scientologists traveled to this city from across three continents to hear Mr. Hubbard speak. He delivered over 600 lectures in Phoenix—more than in any other city in the world. These lectures, along with seminal Scientology works he authored in Phoenix, comprise a significant portion of the religion’s fundamental scripture. On June 23, 2012, Scientologists and guests celebrated the grand opening of Phoenix’s Church of Scientology Ideal Org. The Church’s new home comprises a complex of buildings on a two-acre campus at North 44 th Street and Indianola Ave.
Phoenix dignitaries welcoming the new Church included Mayor Greg Stanton; Arizona Interfaith Movement Founder and Executive Director Dr. Paul Eppinger; Higley Unified School District Community Programs and Policy Executive Director Tony Malaj; and West Mesa Justice of the Peace Mark Anderson. The new 45,000-square-foot Church comprises a complex of buildings on a two-acre campus. The Church invites Phoenix residents to learn about Dianetics and Scientology in its expansive Public Information Center. Visitors are welcome to take a self-guided tour of the Center’s displays, which present informational and documentary films on the beliefs and practices of the religion, as well as the life and legacy of Scientology Founder L. Ron Hubbard. The Information Center further presents the full array of Church-sponsored humanitarian programs, including a worldwide human rights initiative; an equally far-reaching drug education, prevention and rehabilitation program; a global network of literacy and learning centers; and the Scientology Volunteer Minister program now comprising the world’s largest independent disaster relief force. In full, the Center’s multimedia displays contain more than 500 films, available at the touch of a button. The Center is open morning to night and visitors are welcome to return as often as they wish. The opening of the Phoenix Church marks the sixth new Ideal Organization (Org) to open its doors in 2012, including the Church of Scientology Denver, June 16; Church of Scientology Orange County, June 2; Church of Scientology Greater Cincinnati, February 25; Church of Scientology Sacramento, January 28; and Church of Scientology Hamburg, Germany, January 21. Ideal Orgs realize the fulfillment of Founder L. Ron Hubbard’s vision for the religion. They not only provide the ideal facilities to service Scientologists on their ascent to greater states of spiritual awareness and freedom, each is also designed to serve as a home for the entire community and a meeting ground of cooperative effort to uplift citizens of all denominations. Other Ideal Orgs opened in recent years include Minneapolis-St. Paul, Minnesota; New York, New York; Washington, D.C.; Tampa, Florida; Nashville, Tennessee; Seattle, Washington; Las Vegas, Nevada; Los Angeles, California; Pasadena, California; Inglewood, California; as well as Quebec City, Canada; Mexico City, Mexico; London, England; Melbourne, Australia; Brussels, Belgium; Madrid, Spain; Rome, Italy; Berlin, Germany; and Moscow, Russia. Seven new Ideal Orgs are further scheduled for grand opening in 2012. For a complete list of new Churches of Scientology, visit Scientology.org.